How Do You View Genesis? My regular readers know that I am a biblical creationist. Now, don't panic and run off, hear me out, OK? Some of my past articles (like this one) have dealt with the problems associated with compromising with Genesis. I need to clarify something at this point. Many people are overwhelmed with the pressure to compromise because they are told what to think, that evolution is true, the earth is old, the universe is ancient &c. Many do not really think about it at all, but simply go with the flow. 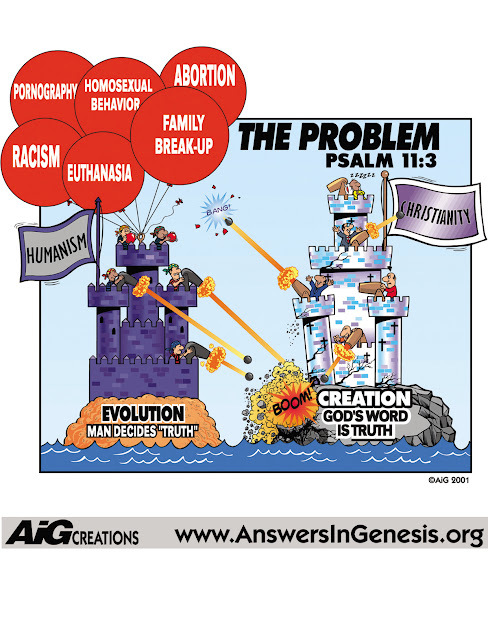 Others see the problems that occur when they tamper with a plain reading of Scripture, so they force-fit a gap between the first two verses of Genesis, invoke the "Day-Age Theory", say that the first few chapters of Genesis is allegorical and that those of us who believe that it means what it says are fringe-group nuts. Some people have not casually accommodated the whims of the current trends of science. They believe that the universe is old. I would in no wise consider them incompetent or that they are not really Christians. (That is the clarification that I wanted to make, the purpose of this article.) But I would really like for them to consider the implications of their positions and how it relates to Scriptures. Especially if these people believe that the Bible really is the Word of God, and is their final authority. Yom יוֹם means a literal day when it is with an indicator like a number, evening, morning and so on. When this happens throughout the Hebrew Scriptures, it is accepted that yom means a literal day (with very few possible exceptions). "And there was evening and there was morning, one day", has three indicators. Why should the first part of Genesis be the exception? It means literal day. Some people want to say that "day" was a long period of time. Well, yom means and indefinite period of time when the indicators (such as numbers) are not there. To justify this, people will say, "The Bible says one day is with the Lord as a thousand years". Read the rest of 2 Peter 3.8, Zeke. It also says "and a thousand years as one day". Keep going, read the context. This verse is not attempting to define "day". Still not convinced? Exodus 20.11 tells us outright that God made everything in six days, and rested on the seventh day. He did this as an example for us. He did not work for six thousand years and rest for one thousand years. We would have some extremely rough work weeks with that exegesis! You're calling Jesus a liar. That's right, I said it! In fact, you're in a bad place with the New Testament, because the early chapters are the most quoted passages. Adam was a real person (1 Cor. 15.45, Jude 1.14) the flood of Noah's time really happened (1 Peter 3.20). Need I go on? I'll be back in another יוֹם or so. subject and hand, and strongly recommend that you click here. Yes, I know. Lousy title. I just wanted you to know that I blundered across something that makes a good follow-up to an article I did on this subject a while ago. It seems that we have made an image of Jesus to fit a "niceness" image that we have created. Why? To make Jesus more palatable? I pointed out that he was not always Mr. Nice Guy. I see I'm not the only one who sees a difference between what has been presented, and the real Jesus. Don't get me wrong! There is truth to the kind, gentle Jesus (Matt.11.28-30). But this truth is out of balance, because he is also the righteous judge that we will face some day. Anyway, this video... About two minutes into it, I perked up because he was saying something similar to what I had said. Hope you like it! I Don't Wanna Be a Casual Christian! This is almost a dual post at "Stormbringer's Thunder", but with a few changes. Just over a year ago, I rededicated my life to Jesus. One of the things that convicted me was getting reacquainted with that Christian music that I knew years ago. Petra, White Heart, Larry Norman, Malcolm and Alwyn, Darrell Mansfield and others. DeGarmo and Key had meant a great deal to me. Somehow, DeGarmo and Key ministered to me the most. I saw them in concert three or four times. Like the other artists, they gave encouragement as well as admonition. Evangelism should go without saying; the "buy one get one to give away" cassette deal has stuck with me for years. (Dig this blues version of a song they mastered earlier, "Are You Ready?".) Dana did that thing that several other Christian rock artists have done: He went into the ministry. Not a surprise, because music is a ministry for many of them. One song they did was very powerful for me, and other people feel the same way. It sums up my feelings (and reminds me of my failings), but is also an encouragement. Gonna live my life a living sacrifice. And now for something completely different. Actually, the message itself is not different, but the way I am going about it is quite different for me. First, some background. As my regular readers know, I am a Biblical Creationist (my Weblog with Creationist messages is here). No, I am not saying that if you are an old-earth Creationist that you are not a Christian. Nor am I saying that if you use a form of "theistic evolution" that you are not a Christian. But I do say that if you claim to believe the Bible, you end up doing some interesting eisegesis to compromise and force-fit your beliefs into what the Bible says. Evolutionism has taken such a stranglehold on modern society that it causes a great deal of confusion to new believers as well as those who want to seriously consider the message of Christianity. Does the Bible mean what it says? Is the Bible wrong in the first place? Can we trust the Bible at all? 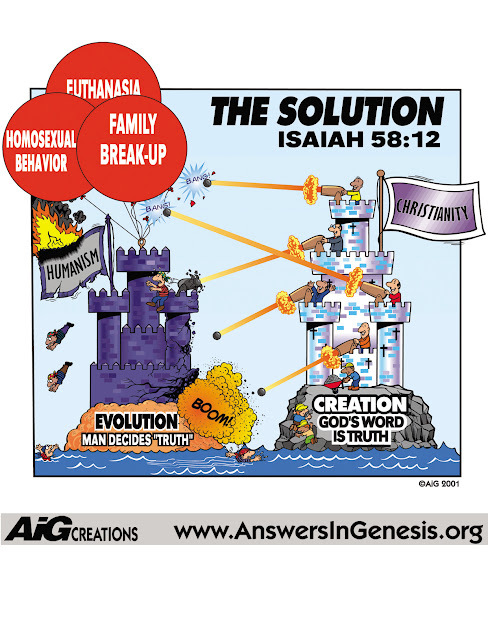 I am not going to lay out the whole case for Genesis here (but I can refer you to Answers in Genesis, the Institute for Creation Research, and Creation Ministries International to get you started. Confusion, apostasy, atheism, compromise are all rampant and seem to be increasing. The good news is that interest in solid Biblical teaching also seems to be increasing (here is just one example). This is the part where I let other people tell their stories. It is a bit tricky. The following content was posted on Facebook, so not everyone will be able to follow a supporting link. I have permission to reproduce the "Note" and comments, and I removed the full names of the participants. If they wish to identify themselves, they can use the comments section. Also, I did a small amount of editing for clarity when people added their own corrections, but that is at a minimum. Finally, Facebook comments do not allow bold, italic, highlighting and other formatting, so people are occasionally used to type IN CAPS for emphasis. Kevin wrote, "On Militant Anti-Creation 'Christians'"
For the life of me (and in spite of my article which argues that some professing Christians who believe evolution can actually be Christians), I can't understand why someone bothers with the rest of Christianity, or professes to be a Christian at all, when he finds any part of the Bible--let alone the foundational chapters--so at odds with what he "knows" to be true. Apart from any debate on Creation or evolution, what is it about the rest of Scripture and Christianity that's so much more convincing (is Christ's resurrection actually more in line with current "scientific" thinking? ), and why would it even seem so when it's so "obviously" wrong about Creation and Christ Himself is apparently mistaken about it? What would draw anyone to a Person claiming deity who goes against "known" science and can't even correct the "mistakes" of the earlier Scripture writers when He brings them up? Why, if evolution is true, doesn't one just take it with all the rest of secular "science" and dismiss all the rest of Scripture where it presumes to give a recounting of history, especially of Christ's resurrection and other miracles--surely much less "scientific" than creationism? Kevin added, "Because I've been misunderstood in the past about the same thing, let me point out that my use of quote marks around "Christians" in the title is simply because I don't know (but I DO know that not EVERY professing Christian IS one) and to indicate that the person in question apparently professes to be one — regardless of anyone else's questions about it or even his own lack of evidence for the new life he's supposed to have...I agree that science DOES verify the Bible and tried to carefully use quote marks to indicate the other guy's view, not my own." Tad wrote, "What I love is how science--viewed from a Godly stance--PROVES the truth and inerrancy of the Bible. Remind me one day to tell you about the Christian astrophysicist who was able to use the Bible to explain a 24 hour discrepancy between mathematical calculations and empirical data." Linda joined in, "Ok, you will probably not believe me 'cause the coincidence seems a little weird. But I had the very same thought earlier today while reading one of the scientific vs unscientific discussions. "The very same question came to mind - if you just can't accept creation, how could you possibly accept the resurrection? I feel I am in very good company, so thanks. I just wish I had posted the point when it came to mind." The highlighted part of her comment brings out something of vital importance that Creationists have been pointing out for a long time. Now it's Grahame's turn: "Tad, I need to hear that as a friend of mine keeps saying that Creationism serves no useful scientific purpose!" Timely posting, isn't it? That is the kind of thing with which we constantly have to contend. What usually happens is that someone reads a book written on a popular level, dismisses all of Creation Science and then other disbelievers congratulate each other on being more intelligent than us. All based on a serious absence of effort on their parts. My mouthy self added, "Rereading 'The Lie: Evolution' by Ken Ham. It's a bit older and could stand a bit of updating, but it still points out how Genesis is the foundation of Christianity. This was one of my baseline teachings. If Genesis isn't true, you have the domino theory of Christianity, one tips into another into another... Jesus referred to Adam as a real man, not a point in our evolution. The flood of Noah's time was not only referred to as an actual event, but a symbol of Christ and the coming judgement (the next time, by fire). In other words, you'd have to do some fancy theological footwork to make excuses, because Jesus, Peter, Paul and the others who referred to Genesis as actual events would be lying! "By the way, none of this 'local flood' nonsense. Not only does the Bible make it clear that it was global, but God wasted an 'undred years of Noah's time building an ark when God could have said, 'Pack your bags and move to a different valley, because this area right here is flooding out'." "Creation/evolution was the biggest issue I had to deal with when I first became Christian in my first year of college some 30 years ago. I could not honestly reconcile what I read in Genesis with the theistic evolution presented in apologetic books like 'Science Speaks' by Peter Stoner. I just wanted to know the truth. If evolution was true then I knew the first chapters in the Bible were false. I guess I’m someone who can’t compartmentalize my thinking: If I can’t trust the first few chapters in the Bible to tell the truth, then how can I trust the rest? "I remembered in high school reading a review of 'The Troubled Waters of Evolution' by Henry Morris in a local paper. The review mocked the book, but I remembered the title and I sought the book out in the local library. Reading it was like a breath of fresh air. I then found a copy of 'Evolution: The Fossils Say, No!' By Duane Gish and gobbled that up. And the rest is history. "I’ve been debating evolutionists ever since then. The debate gets tiring online at times because the semi-anonymity of the Internet causes many evolutionists to be a lot more dishonest than they normally would be face-to-face. The bald-face lying of Jim Thorpe on CMI’s fan page comes to mind." Kevin returned with, "I read all three of the books you mentioned long ago myself also and had the same problem with 'Science Speaks', at least later, when I was clear enough in my understanding to see the problems with his belief in an old earth. I was somewhere in my mid-teens when I read my father's copy of Henry Morris's 'Scientific Creationism,' the first one I read, out of curiosity, and what started me following the whole Creation/evolution and apologetics issues. (Now my dad comes to ME with related questions and uses material I've written in his Bible studies and other Christian training.)" Ashley joined the discussion: "You know, I was like Don. When I started my life as a Christian, Evolution was a big obstacle. I tried to reconcile by looking up materials by theistic Evolutionists and talking to college professors here from a popular Christian colledge called Southeastern University (George Bush Jr. visits regularly). They compromised big time by teaching that Darwin believed in God and didn't have any beef with him, Evolution is true, and that radical Christians (Creationists) make Darwin out to be a bad guy. "Needless to say, I spent a lot of time in limbo trying to figure out how in the world Evolution didn't contradict the Bible to no avail. It did every way I looked at it. Then, one day, I went to a "theme" park called Dinosaur World. While reading the information they gave about the individual dinosaurs, everything had peculiar information. Like, "it is uncertain", "unknown", "maybe", was written on every single plaque. Something minor like that pushed me to learn more about Evolution and Creation. "Through that journey, I, to this day, have no idea how any reasonable person can think/say that theistic Evolution is legit or back Evolution up altogether. It is so.....flawed. There's no other way of saying it. It takes incredible faith to believe in such a flawed concept. At least things being discovered that the Bible has recorded is consistent. Nothing that has been observed has contradicted it. Not one thing. I don't understand why people are willing to compromise." Addendum: Ashley wanted me to add this link to "Creation: Why It Matters". OhMyYes! Tad contributed, "Here's another point to throw in the face of these "scientists": it's called the THEORY of Evolution. THEORY. Not LAW. If they truly understood science, they would know that there are WORLDS of difference between the two concepts, and so might find it more readily easy to abandon such a flawed concept as evolution. Oh, silly, silly me — that's probably why they try to teach it as if it were a scientific law. To easy to lose adherents if it were merely a scientific theory. Hence, of course, MY use of the quote marks when referring to "scientists". Guess there are professing scientists, same as there are professing Christians, eh?" Jonathan cautioned, "Tad, all the same, be careful about such statements, as shown in http://creation.com/arguments-we-think-creationists-should-not-use#just_theory". These people had questions and doubts that may have eventually caused them to abandon their faith. Fortunately, they did some investigation and learned the truth about the Bible and Creation Science. This is an excellent example of why it is so important to know what we believe, why we believe it, and are able to explain that our faith is not blind, but is actually reasonable (1 Peter 3.15).